March 20, 2011 in "Reviews", "environment"
By all accounts, Michael Reynolds is driven. An architect based in Mexico, he has taken traditional adobe based building methods from the southern states of America, and Africa, new science on thermal mass, solar and wind technology, sewage treatment methods from ancient Eygpt and the Middle East, and fused them with a uniquely American sense of gonzo independence, to build increasingly efficient self powered buildings over the last 35 years. He runs a company called Earthship. 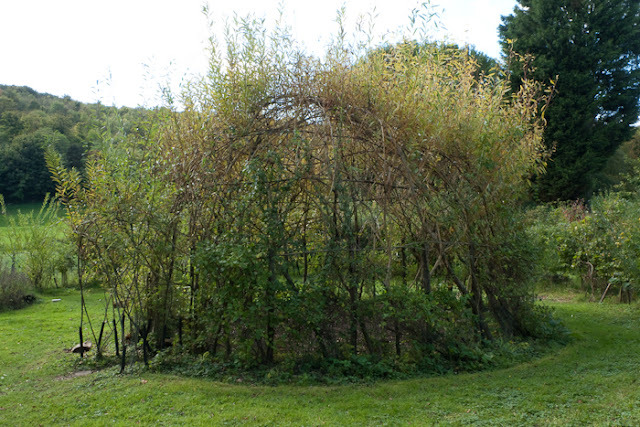 UK structure inspired by his efforts, built in Brighton and finished about 5 years ago. The Low Carbon Trust built this unit as a community centre for Stanmer Organics. Its set in acres of beautiful south facing land, surrounded by huge allotments containing a variety of projects, mostly permaculture and education based. They run sunday tours and the website is here. On our tour we were met by Johnathan, who talked about 20 of us through the basic principles of an autonomous building. Waste materials - tyres and bottles, are packed with mud and dirt and used to build huge walls, finished ideally in adobe or lime. Large south facing window glass heats an atrium, which in turn warms this massive structure and helps maintain a constant ambient temperature throughout the year. A combination of of new and old filtration technology cleans water and feeds plants, and solar panels provide the electricity. Here's a short film, which features Johnathan describing in brief some of the methods they use in Brighton. The ideal is that the building should be made with otherwise polluting materials and be completely independent from external energy providers burning fossil fuels or using other dubious sources. These structures are not on the grid, and their owners pay no money to utility companies. The realities in Brighton are more complex: The walls are actually concrete and not lime, which is not ideal since in production, lime absorbs Co2, whereas concrete is a huge Co2 producer. The reed beds used to treat sewage are still establishing themselves here. 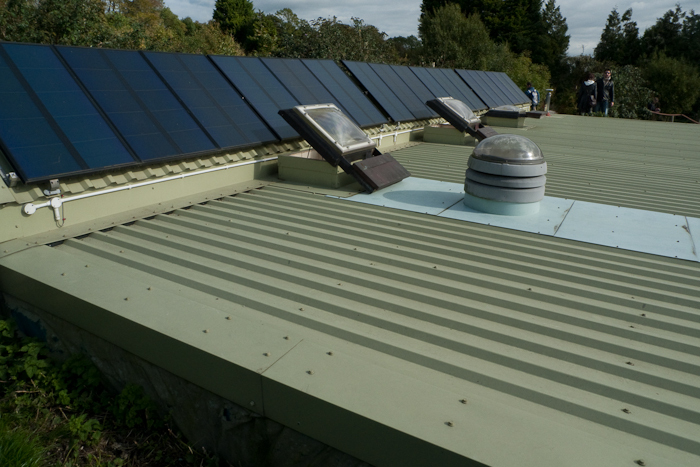 The solar cells provide most of the electricity but heat and fuel for cooking are supplemented by gas canisters and the stove burning recycled chips shown in the video. 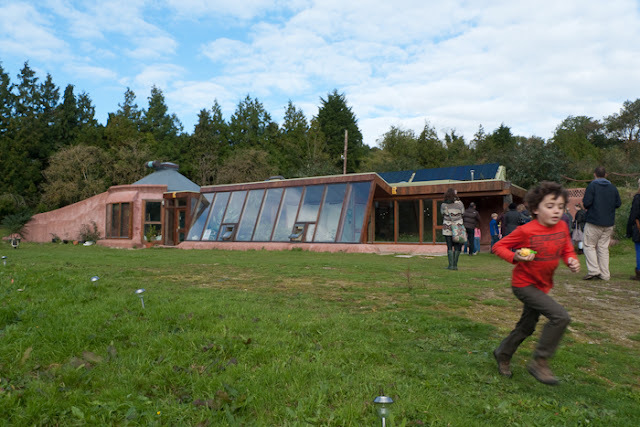 I have since spoken to someone who used to share space adjoining the earthship during construction, who had unflattering things to say about the way the build was undertaken and the disruption to the other users on this soil association accredited land. The tour lasted about 1.5hrs and was an excellent insight into this building technology, which aims to take the very best of new and old methods and combine them to free the user of carbon dependency. Johnathan was open and honest about the planning and construction loopholes the organisation had to jump through - several years of legal battles resulting in sizable compromises over materials and use. As it stands at present in the UK, such a building is illegal as a dwelling and was permitted only as a public (non living) space. He was also realistic about the power based shortcomings, and the crew aim to improve its performance over time. What is fascinating is the idea that buildings can be constructed to be independent from our existing, rather poisonous infrastructure, and the climate can be 'farmed' locally with minimal impact to provide free or at least much cheaper energy. In our austere times, this may work for those wanting to save the planet and those wanting to save money! Legal restrictions on building these structures show just how much certain organisations and industries have to lose - but from the tour, it was clear that there is much to gain by experimenting with and learning from at least some of these methods. Finally, the piece de resistance, quite literally. There is a great feature film about Michael Reynolds and his struggle to develop sustainable architecture in Taos, Mexico over the last 35 years. It documents some of the build methods, the communities that have formed around these ideas, the leviathan legal struggles he has undertaken, and the companies current emergency relief work in Haiti and the Anderman Islands. The full length version is well worth a watch.